Nairobi is the largest city and capital of the modern state of Kenya as well as the former capital of British East Africa. Nairobi was originally a camp for the engineers constructing the Uganda railway from Mombasa to Lake Victoria in 1899. Later that year, the railway headquarters was moved there and the settlement began to take on the responsibilities of a territorial capital. Soon afterwards European-owned businesses sprang up and by 1900 there was a significant Indian community and bazaar. As a consequence of the growth, the Masai peoples occupying the site were removed by British colonial officials. The suitability of the town’s swampy location was called into question by plague outbreaks in 1901 and 1904 but Nairobi’s prominence with Kenya was assured when plans to construct a new capital were deemed unrealistic and Nairobi was officially made capital of the territory. Nairobi’s colonial years were marked by racial inequality. Legislation limited the ability of native Africans to own property and created a “pass system” by which their movements in the capital were tightly controlled. Both Indians and native Africans, with the exception of domestics, were confined to certain neighborhoods by both restrictive covenants and the placement of facilities, such as hospitals, which catered to specific ethnic groups. Segregation, with natives excluded from many hotels, restaurants and the like, was also common. Natives were also forced to endure British paternalism which ranged from lectures on etiquette to the state discouraging native owned businesses ostensibly to prevent them from duping one another. The tension created by these policies frequently triggered unrest in the city including most notably the Mau Mau movement of the 1950s. In 1963, the nation of Kenya, with Nairobi as its capital, gained independence from Great Britain. The newly independent Nairobi continued to grow at a breakneck pace, more than doubling its population from about 340,000 in 1963 to over 800,000 by the 1980s. 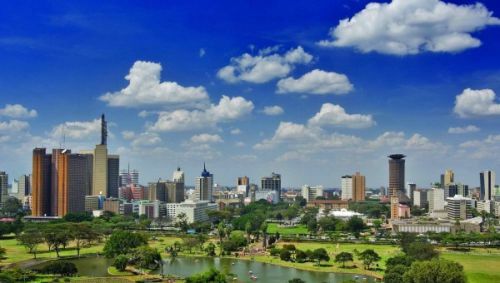 Post-independence Nairobi retained its cosmopolitan ambiance with distinct European, Asian, and native African neighborhoods despite the end of segregation. In addition to being the seat of the Kenyan Government, Nairobi also plays host to international bodies such as the regional headquarters of UNICEF. Post-independence Nairobi has also seen its share of troubles. Political demonstrations, often with religious undertones, are not uncommon. One such demonstration on July 7, 1997 was aggressively dispersed by the police. On August 7, 1998, the United States Embassy in downtown Nairobi was destroyed by a bomb planted by Al-Qaida which caused extensive damage and over two hundred deaths. In 2007, the disputed presidential election produced a wave of political violence in the capital. Herbert H. Werlin, Governing an African City: A Study of Nairobi ( New York: Africana Publishing Co., 1974); Galia Sabar, Church, State, and Society in Kenya: From Mediation to Opposition, 1963-1993 ( London: Frank Cass, 2002); W.T.W. Morgan, Nairobi City and Region (New York, Oxford University Press, 1967); Jeffrey Gettleman, "Disputed Vote Plunges Kenya Into Bloodshed", The New York Times, December 31, 2007, Retrieved from http://www.nytimes.com 13 May 2010.